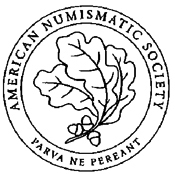 The American Numismatic Society is the national institution advancing the study and public appreciation of coins, medals and relatedobjects of all cultures as historical and artistic documents. Founded in 1858, the ANS houses the world's largest numismatic library and America's most comprehensive collections of numismatic objects representing over 2,500 years of material culture. The American Numismatic Society regularly issues monographs in two principal series. Numismatic Notes and Monographs (ANSNNM) and Numismatic Studies (ANSNS). Special series include the publication of private and public collections of research value in Ancient Coins in North American Collections (ACNAC); the publications of the Society's Greek collection in Sylloge Nummorum Graecorum; and the Proceedings of the Coinage of the Americas Conference (COAC). The ANS also publishes a semiannual, annotated bibliography, Numismatic Literature and an annual journal, formerly ANS Museum Notes, now the American Journal of Numismatics. Browse all titles by the American Numismatic Society.